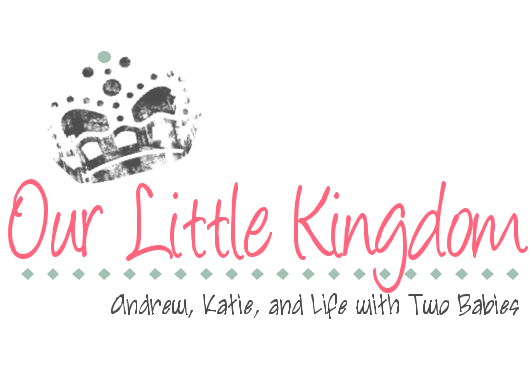 Our Little Kingdom: ANOTHER Blog Facelift! Okay, now we have an entirely new-looking blog! I am pretty excited about it, mainly because it's more user-friendly and I can make it more cute. However, I am still working out the kinks a little bit so bear with me! In other news, Holly was seven weeks old this week! I can hardly believe it. Time is going by so fast and she is getting so big! She is so cute and so much fun. Also, Andrew is starting a new job in a couple of weeks! We are both really excited about it (acutally, mostly it's just me). He is going to work at a hospital closer to home and in the operating room, which should be exciting for him. Right now at his current job, he works from 7 p.m. to 7 a.m. three days a week but at his new job, he will work 8-hour shifts Monday through Friday! He will also be on call sometimes. I am really excited about his new, normal schedule. We will be able to make plans as a "normal" family does! Pretty exciting. I am so glad you left a comment on my blog becuase the address I had for your blog was not working! Thanks for all the updates. Holly is just a doll. Are you just loving it or what? We really miss you guys.